...Konstantin Simeonov Kavrakov, a Bulgarian hacker, who hacked into the ATM and stole thousands of dollars from the bank account of Microsoft mogul Bill Gates with fake ATM cards arrested in Philippines, according to the Philippine National Police. The 31-year-old man was arrested red-handed by the Philippine National Police while he was withdrawing cash from an ATM using fake cards. He had stolen tens of thousands of dollars from many victims by hacking into the automated teller machines (ATMs). 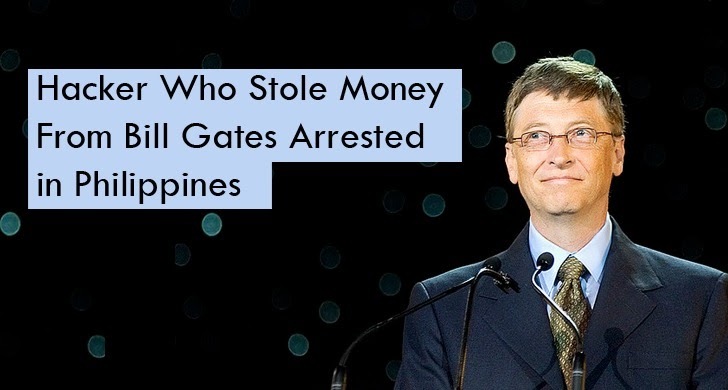 In 2011, Kavrakov got arrested and was jailed in Paraguay for hacking into the Bill Gates' account in The Philippines' densely-populated Quezon City and stealing thousands of dollars. Since then Kavrakov was on the hit list of many countries police. During the arrest, the police recovered seven cloned credit cards, nine PPS Bank Quezon Avenue ATM branch receipts, and P76,570 (US$1715) in hand. The assorted credit cards include a Citi Visa, Eastwest Bank Vice, Citibank MasterCard, Standard Chartered MasterCard, Citibank Visa, Citi MasterCard and a blank Gold card. The arrest took place in a joint operation of the Presidential Anti-Organized Crime Commission (PAOCC) and Philippine National Police’s Criminal Investigation and Detection Group (CIDG). The police believe that Kavrakov is the head of an International network of cloning bank cards, which was actively working in United States and European countries from last 10 to 12 years. Kavrakov was under surveillance operations, Operation Jugador ('Gambler'), by the authorities that target foreign carders and online gamblers.